Prominent & Leading Manufacturer from Pune, we offer water melon seed - sweetoo black (hybrid), bitter gourd seed- amar tara (hybrid), brinjal seed - amar 10 (hybrid), chilli seeds- chutaki (hybrid), cucumber seed- laxmi ( hybrid) and cucumber seed- shubhangi. The outer cover of Water Melon–Sweetoo, the refreshing summer fruit is blackish green in color, round in shape and medium in size. The inner flesh of the fruit is dark red, compact, crispy and sweet. 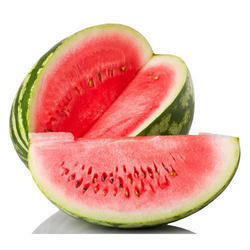 The ripened water melon has less seed content and is tolerant to wilt disease. Having excellent keeping quality, the fruit is suitable to be cultivated in all seasons. The harvesting of Bitter Gourd seed–Amar Tara starts within 60-65 days and the fruit that is produced is of 5-6 inches in length. The color of Bitter Gourd–Amar Tara is dark green and has thick spines. It has huge demand in the overseas market and is suitable for cultivation in all seasons. The hybrid brinjal-amar is ready to harvest within 70-75 days of transplanting. The fruits so produced are thorn less, light green in color, cylindrical and 6-9 inches long. 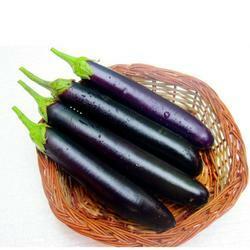 The Brinjal-Amar is suitable for cultivation in all seasons and is hugely demanded in hotels, malls and local & super markets. 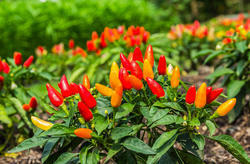 Chilli-Chutaki, one of the finest qualities of chillies is ready to harvest within 70-75 days of transplanting. The fruit so grown is attractive, shiny, dark green & red in color. It is 1.5-2 inches in length and triangular in shape. It is resistant to wilt and viral diseases and is preferred for pickles and processing purposes. It is highly suitable for cultivation during all seasons. 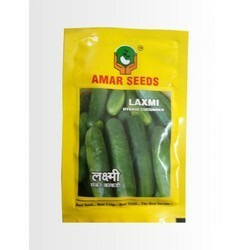 The harvest of Cucumber seed–Laxmi starts within 40-45 days and the fruit so produced are attractively green in color. Cylindrical in shape and good in taste, the grown cucumber has less seeds and is tolerant to powdery mildew. 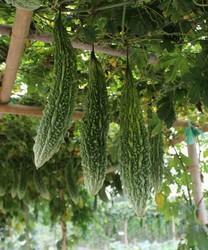 The cucumber-laxmi is preferred in both local and distant markets owing to good keeping quality. 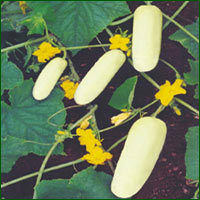 The harvest of Cucumber seed–Shubhangi starts within 40-45 days of transplanting. The fruits that are produced are green, tender and 6-7 inches in length. These have good keeping quality and are cultivated in all the seasons. The seeds that we offer for cucumber cultivation are tested several times on their quality before they are supplied to the customers. The harvest of the crop starts within 40-45 days and the fruits are attractive white, cylindrical, crispy and tasty. 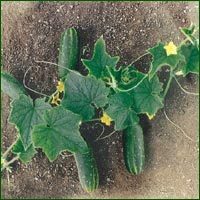 The cucumber that is grown has less seeds and are resistant to yellow mosaic disease. These have good keeping quality and therefore do not get spoiled easily.